Sault Ste. 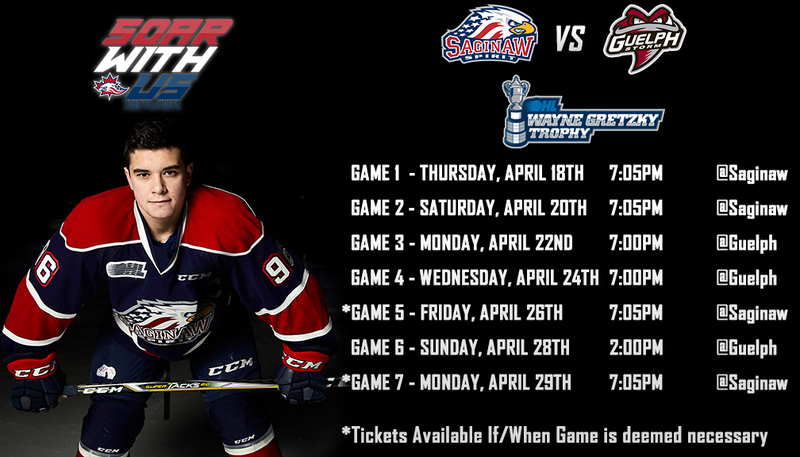 Marie, ON – The Saginaw Spirit look to close out the Soo Greyhounds in Game Four of the Western Conference Semifinals on Thursday, April 11. Puck drop from the GFL Memorial Gardens in Sault Ste. Marie, Ontario begins at 7:07 p.m.
Saginaw took the first three games of round two and outscored the Soo, 21-7. The Spirit continued the strong penalty killing performance in Game Three. Saginaw top-ranked, post-season shorthanded unit has killed all 28 man-power disadvantage situations in this season’s playoffs. The Spirit also leads all Ontario Hockey League (OHL) teams with four shorthanded goals in the post-season. 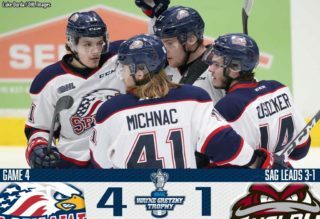 The Saginaw Spirit came back in Game Three from a three-goal deficit to defeat the Greyhounds, 7-5. Saginaw first round pick Cole Perfetti tallied the game-winning goal with just over six minutes remaining in Tuesday’s road victory. The rookie left-winger has seven points in six post-season games this season. 2017 Florida Panthers 10th overall pick Owen Tippett leads the OHL in post-season goal scoring with eight goals. The star right-winger is second behind just London’s Evan Bouchard with 17 points this post-season. The Peterborough, Ontario native is coming off three-consecutive three-point efforts in round two. 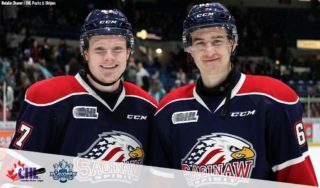 Tippett has at least a goal in all seven Saginaw post-season games this season. Along with Tippett, Detroit Red Wings prospect Brady Gilmour and Edmonton Oilers second round pick Ryan McLeod make up the Spirit’s most successful line offensively through these playoffs. Gilmour, a seventh-round pick of Detroit, has a five-game point streak coming into Game Four. The Grafton, Ontario native contributed multi-point games in four of the last five contests. Gilmour leads all Spirit players in assists (10) and is second in points (12) this post-season. 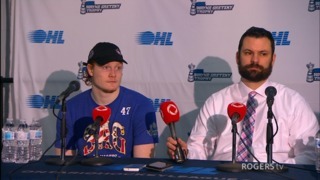 Mississauga, Ontario native McLeod is third among Spirit players with eight points in seven games this post-season. 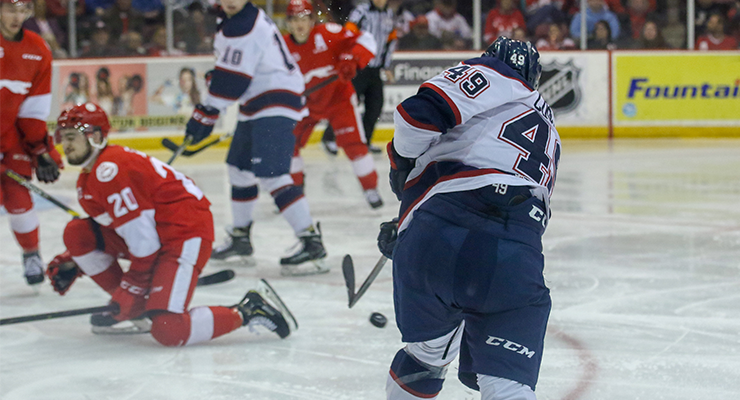 The Saginaw center has two goals and two assists for four points in round two. Sault Ste. Marie, Ontario native Camaryn Baber has goals in the last two games against his hometown team. The 2019 NHL Draft prospect gave Saginaw their first lead in Game Three with his second period tally. Arizona Coyotes prospect Ivan Prosvetov post-season play has been stellar for the Spirit. The Russian net-minder is third in the OHL Playoffs this season with a 2.23 goals against average and second with a .938 save percentage. 2019 NHL Draft eligible prospect Joe Carroll shined for the Soo in his first game off an injury. The center from Carp, Ontario collected two goals in Game Three and was honored with the game’s second star in the losing effort. Philadelphia Flyers first round pick Morgan Frost scored his first goal of round two on Tuesday evening. Saginaw has done well to contain the Soo’s regular season points leader with just two points in the first three games. Barrett Hayton, a 2015 Arizona Coyotes fifth overall pick, had his best offensive output of round two on Tuesday. Hayton collected three points in Game Three after the Spirit kept the center off the scoresheet in the first two games. The Peterborough, Ontario native leads all Soo players with 13 post-season points this season. 2018 Soo Greyhounds second round Import Draft pick Jaromir Pytlik is second in the OHL post-season in rookie scoring. The right-winger scored his first goal of round two in the first period of Game Three.